Home » Vendors » ADFITECH, Inc.
Adfitech has been providing Quality Control and Due Diligence Services to the mortgage industry since 1983. We provide Post Closing and Pre-funding QC, Servicing Oversight, V3 Fulfillment, MERS Audits, Imaging, Indexing and Data Capture. 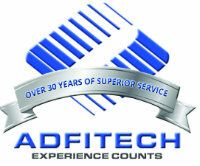 Adfitech specializes in Due Diligence and is Rating Agency Reviewed. Clients served include Reverse Mortgage Lenders, FHLB’s, Mortgage Bankers, Community Banks, Savings & Loans, State Housing Agencies, Credit Unions, MI Companies, FHA’s and Wall Street Investors. Our main focus is building and maintaining client relationships. We utilize real-time and customizable interactive reporting to ensure that results are available when needed and in a format that meets individual needs. Adfitech also gives its clients the ability to track findings, and interact with QA reviewers to clear up issues or trailing documents.